‘Live In Concert’ - A performance, be it live or a studio recording is an experience every artiste cherishes. In a studio recording, the artist’s limitless caliber might tend to get constricted by space and time constraints. However, a live concert works on slightly different parameters. The acoustics and ambience of the performance venue are critical factors and help set the artiste’s mood initially. But the quality of the audience is what matters most. An appreciative audience can enhance the performance level. After all, when someone chooses a career as a performing artiste, the most motivating factor is appreciation. And when that is forthcoming, all else including economics, takes a back seat. The chemistry between the main artistes and their accompanists also gets a boost in the presence of a live audience. Besides, even the accompanists are encouraged to show off their musical prowess and draw personal appreciation. When a simple ‘Wah’ converts to an ‘Aha’, an artiste’s ‘Sadhana’ towards the pursuit of the art form is justified. This further inspires the artistes to surpass their own levels. A few such precious moments of creativity have been captured by Saregama and are presented in this series ‘Live In Concert’. The ‘Shehnai’ is synonymous with the name ‘Ustad Bismillah Khan’. He was single-handedly responsible for making the Shehnai a centre-stage classical instrument. His ancestors were court musicians, thus offering him a musical environment since childhood. Khansaheb had the rare honor of performing at Delhi’s Red Fort on the eve of India’s Independence in 1947. He also performed at the Red Fort on the eve of India’s first Republic Day ceremony, on January 26, 1950. Khansaheb had a brief association with movies. The melodious sound of the shehnai in the film ‘Goonj Uthi Shehnai’ is highly memorable even after all these years. ‘Bharat Ratna’ the highest civilian award was bestowed upon Khansaheb in 2001. Besides many others, he has also been honoured with the Sangeet Natak Academy and Padma Vibhushan. Girijadevi is a doyen of the Banaras gharana. She was trained by Sarjuprasad Misra and Shrichand Mishra, first in Khayal and later in Thumri. Devi made her public debut at the age of 20 on All India Radio, Allahbad. She helped elevate the profile of thumri, and sang a variety of other styles, including khayal, dhrupad, folk music and tappa. A recipient of the Padmashree and the Padma Bhushan from the President of India, she had been honored by all the music academies of the states. The coveted title of ‘Sangit Shiromani’ by the Prayag Sangeet Samiti, Allahabad was also bestowed upon her. In heer musical career spanning over four decades, Girijadevi performed across the globe besides at all prestigious music conferences in India. Teaching at the ITC Sangeet Research Academy from its inception in the early ‘90s, Devi served as guru for many students, including Dalia Rahut, Jayita Pandey and Satyanarayan Misra, the son of her own guru, Pandit Sarju Prasad. Leaving the school after 12 years, she returned to Varanasi, where she became a visiting professor at Banaras Hindu University. 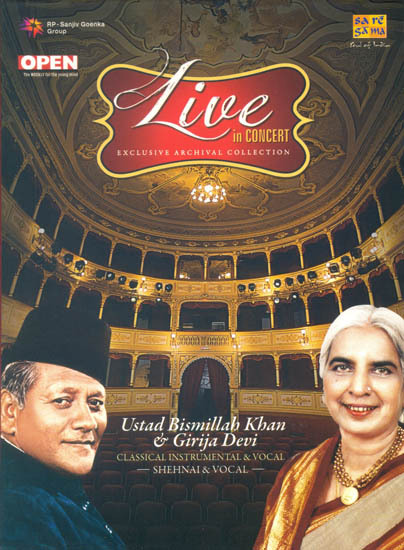 This two CD-pack encompasses the live concert recordings of Ustad Bismillah Khan and Girijadevi, thus justifying the series ‘Live In Concert’. CD 1 comprises a ‘Jugalbandi’ or duet between the two stalwarts. The album opens with a Thumri in raga Mishra Pilu followed by a ‘Chaiti’, a musical form derived from folk songs. Its theme mostly revolves around romanticism. Ustad Bismillah Khan’s presentation in Raga Kedar is followed by a ‘Dhun’ in Ragamala. Combinations of Instrumental and Vocal performances make for a unique collection. The recordings in this album are from a festival held at Nehru Centre, Mumbai under the prestigious banner of RPG Enterprises.